At the outbreak of the war, the Japanese Navy possessed some of the world's finest torpedoes, including the fabled Long Lance. The quality of these weapons was no accident, but rather the result of Japan's intensive efforts during the 1920's and 30's to make good the shortcomings of her battle fleet. Laboring as she did under the unfavorable 5:5:3 ratio of capital ships imposed by the Washington Naval Treaty, Japan would most likely be at a disadvantage in any Pacific conflict with the United States. She also knew well enough that the U.S. modeled its fighting doctrine on the famous 'Plan Orange', which called for an advance of the American battle fleet across the Pacific to relieve the Phillipines. It was anticipated that at some location in the Western Pacific a decisive battle would be fought. In Japan's view, some means must be found to offset its disadvantage in capital ships before this battle occurred, or its inferior batle line would be destroyed by the American force. Torpedo tactics and night combat were seized upon as one way to whittle down the American battle line as it made its way across the Pacific. Accordingly, Japan worked diligently to develop the tactics needed to implement this new doctrine, and also to create the weapons with which to carry it out. The result was that Japanese torpedoes showed a steady progression of improvements throughout the 1930's, culminating in the devlopment of the famous 'Long Lance' in 1935. Designing and perfecting the Long Lance required solving some extremely difficult technical problems, most of which centered around the usage of pure oxygen as a fuel (rather than compressed air). Compressed air is nearly 77% nitrogen, which is useless for combustion, and also contributes to the visibility of the torpedo by leaving a bubble track on the surface. The usage of pure oxygen promised far greater power and propulsive efficiency, but it came with certain costs. The most glaring of these was how to use pure oxygen safely aboard a ship or submarine, given its inherently inflammable nature. 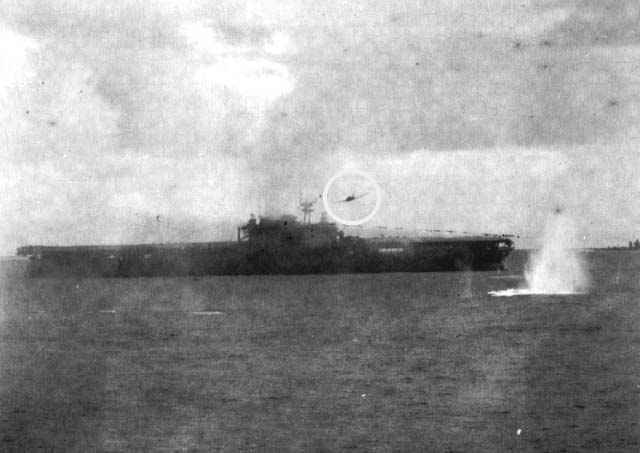 Premature detonation of the torpedo upon firing was also a problem. However, the Japanese overcame these hurdles. Further, through meticulous live-testing of their weapons against ship targets, they perfected a warhead detonator that was rugged and reliable (The U.S. Navy's BuOrd could certainly have taken a lesson or two here). The resulting weapon, the Type 93 torpedo, was fantastically advanced in comparison with its Western counterparts, possessing an unequaled combination of speed, range, and hitting power. This weapon, coupled with the flexible battle tactics practiced by Japan's cruisers and destroyers, led to victory after victory in the early stages of the war. Only as American radar and gunfire control became increasingly sophisticated would the Japanese advantage in night battles begin to disappear, and even then a Long Lance-armed Japanese destroyer was still a thing to be feared. 15,000m @ 26 kts ? An older torpedo still used in some of the older RO-class submarines. 20,000m @ 28 kts ? 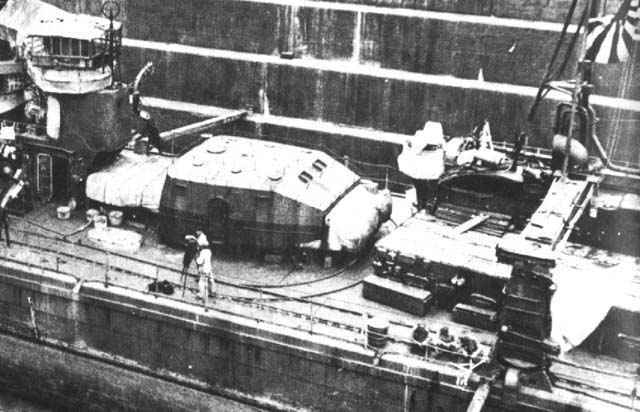 A large conventional wet-heater torpedo still used aboard some older cruisers and destroyers, notably Nagara. Type 92 21" 23' 5" 3792 lbs. 661 lbs. 7000m @ 30 kts 120m / 7,000m An electric torpedo for submarines, used extensively throughout the war. 1500m / 40,000m The Long Lance. 'Nuff said. 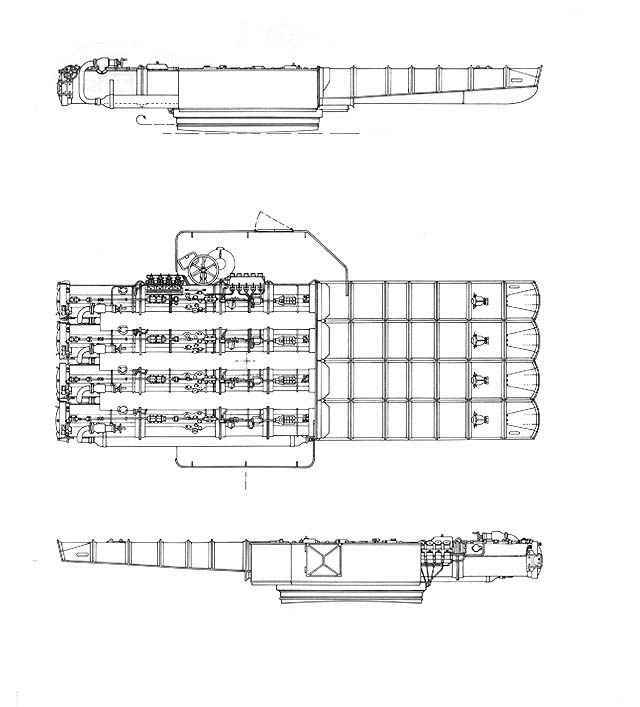 250m / 12,000m A smaller version of the Type 93 intended for submarines. Type 97 17.7" 18' 5" 2161 lbs. 772 lbs. 5,500m @ 44 kts 80m /5,500m A miniaturized Type 93 intended for midget submarines. Very unsuccesful (its oxygen flasks leaked a lot), it was used operationally only once - at Pearl Harbor. Just for giggles, let's take a look at the statistics on the standard US Navy destroyer torpedo of the war, the Mark 15. 13,700m @ 26 kts ? 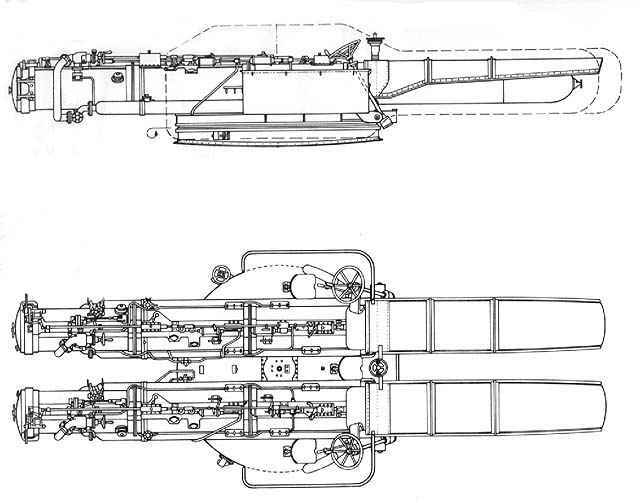 Japanese warships mounted their torpedoes in several different types of mounts, ranging from dual-tube configurations, all the way up to quintuple tube mounts. 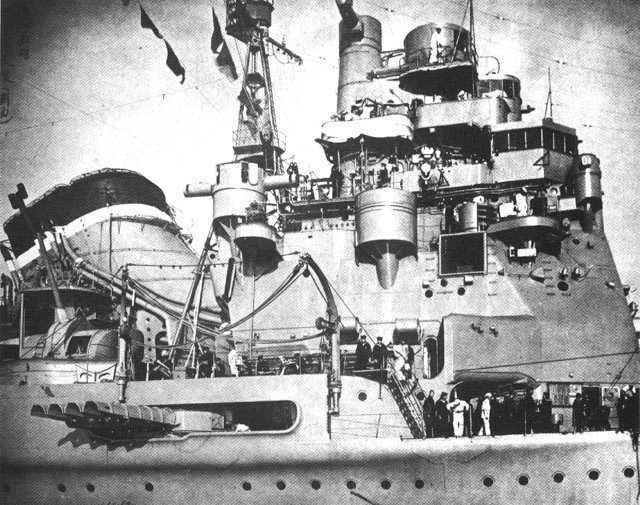 Destroyers most often carried triples (in the Fubuki's (1928) thru the Hatsuharu's (1935)) and quads (Shiratsuyu (1936) on) thereafter (except for Shimakaze, which carried three quintuple mounts). Cruisers carried doubles, triples, or quadruples. I'm not really an expert on Japan's airborne torpedoes, so I don't have much in the way of enlightenment to dole out on the subject. I mean, they worked, and went 'Boom' and so on. The Japanese managed to deploy them in some pretty interesting places, most notably in Pearl Harbor, where the shallow depth of the water necessitated the modification of the existing torps with wooden fins so as to as make them dive less deeply upon entry into the water. Mod 1 17.7" 17' 4" 1728 lbs. 331 lbs. 2000m @ 41 kts 260 kts. An older torpedo that was still being used in some land-based JNAF torpedo-bomber squadrons at the beginning of the war, including some of the units ('Nells') which attacked and sank Repulse and the Prince of Wales. Mod 2 17.7" 18' 0" 1841 lbs. 452 lbs. 2000m @ 41 kts 260 kts. First deployed in April, 1941. Carried by the 'Kate' torpedo bombers which attacked Pearl Harbor. Mod 3 17.7" 17' 4" 1872 lbs. 529 lbs. 2000m @ 41 kts 260 kts. First deployed in mid- to late-1942. Mod 3 Improved 17.7" 17' 4" 1889 lbs. 529 lbs. 2000m @ 41 kts 300 kts. First deployed in 1943. Strengthened to allow higher launch speeds. Mod 3 Strong 17.7" 17' 4" 1872 lbs. 529 lbs. 1500m @ 41 kts 350 kts. First deployed in 1944. Strengthened to allow higher launch speeds. Mod 4 Strong 17.7" 17' 4" 2030 lbs. 679 lbs. 1500m @ 41 kts 350 kts. First deployed in 1944. Mod 7 Strong 17.7" 18' 9" 2319 lbs. 926 lbs. 1500m @ 41 kts 350 kts. First deployed in 1944.